CORNWALL ONTARIO – Now in its 29th year, PwC MS Bike – Ottawa to Cornwall is one of the most popular cycling events in eastern Ontario and it’s fast approaching. It will take place Aug. 18-19 and the Cornwall Chapter of the Multiple Sclerosis Society of Canada is looking for volunteers to help make it a big success once again. With routes ranging from 80 and 225 kms, MS Bike attracts more than 600 cyclists of all levels who come together for the event from Ottawa to Cornwall, all to raise money to support important programs and services, and fund ground-breaking research. When MS Bike participants gear up, they are taking a stand against MS and are supporting those affected by multiple sclerosis. The Cornwall Chapter needs more than 100 people to help on one or both days with loading and unloading the luggage truck, preparing and serving food at checkpoints, and providing logistical support every step of the way. 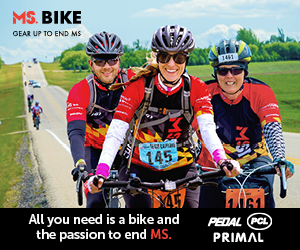 “Volunteers are the backbone of our events, and we’re looking for about 100 people to help with MS Bike, especially in Cornwall and the communities along the route,” says Kristin Harold, regional director for eastern Ontario. “We need help with everything from route signage and setting up checkpoints to monitoring the route and even cheering the cyclists across the finish line. MS Bike starts at the Larry Robinson Arena in Metcalfe, Ontario, continues along a scenic route through Marionville, Crysler, Finch, Long Sault and ends in Cornwall at the NAV CENTRE. Most participants stay overnight and return along a similar route the next day. To ensure a safe and enjoyable event, the entire course is also monitored by support-and-gear vehicles and bike mechanics, and checkpoints are set up every 15 to 20 kms stocked with beverages, fruit and high-energy bars. This event is a great opportunity for individuals to volunteer and meet new people, but it’s also a fun way for sports teams, service clubs, work places and high school students needing volunteer hours to get together and give back to their community. To volunteer for MS Bike, please contact Julie Findlay, coordinator, fund development and administration, at 613-728-1583 ext. 3326, or email julie.findlay@mssociety.ca. Online volunteer registration is also open at https://bit.ly/2KR325R. To find out more about MS Bike – Ottawa to Cornwall and register to participate, please go to www.msbike.ca. This PSW ad is thanks to CFN’s Community Charity program. It’s co sponsored by regional businesses and individuals. If you wish to learn more about this program email jamie@cornwallfreenews.com or dial 855 444 1133. If you are a charity or not for profit looking for support you can contact us as well. Space is based on the amount of community support given to this amazing program! This is a perfect opportunity for the Canadian Forces School of Air Traffic Control Operations (at the NavCan Training Centre) to step up for the community, and a worthy cause. How about it CFSACO? A great opportunity for students, staff, and the community to mix, mingle, and make this event a win for everyone. 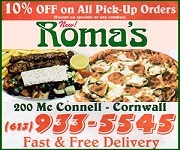 The contact info is all here.